Washington, DC — The Violence Policy Center (VPC) has documented at least 499 fatal non-self defense incidents since 2007 resulting from individuals legally allowed to carry concealed handguns, and this number almost certainly represents a fraction of the actual total. Today, the VPC released the latest update to Concealed Carry Killers, an online resource that provides examples of non-self defense killings by private citizens legally allowed to carry concealed handguns in public. Overall, Concealed Carry Killers documents 499 incidents since May 2007 in 36 states and the District of Columbia, resulting in the deaths of 671 people. 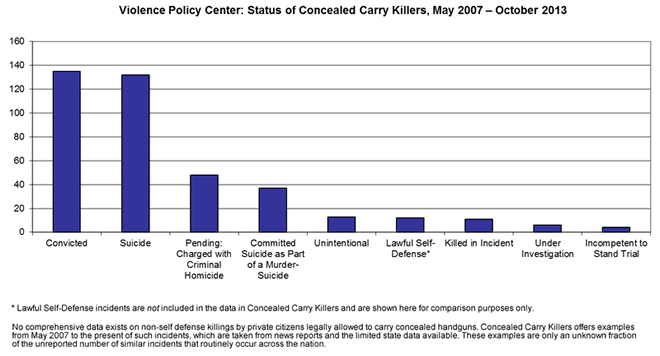 Concealed Carry Killers includes detailed information (primarily from news reports) for the majority of the 499 incidents, organized by state, including (if available) the age of the perpetrator and the victim(s), the weapon used, the relationship(s) of those involved in the killing, and motives for the killing when stated. One of the recently convicted concealed carry killers was Michael Dunn, who on November 23, 2012 shot and killed 17-year-old Jordan Davis at a Florida gas station in an argument over loud music. Last week, on October 17, Dunn was sentenced to life in prison without the possibility of parole. In the vast majority of the 499 incidents documented (413, or 83 percent), the concealed carry killer either committed suicide (190), has already been convicted (165), perpetrated a murder-suicide (43), or was killed in the incident (15). Of the 68 cases still pending, the vast majority (59) of concealed carry killers have been charged with criminal homicide. Five were deemed incompetent to stand trial, and four incidents are still under investigation. An additional 18 incidents were fatal unintentional shootings involving the gun of the concealed handgun permit holder. The 499 incidents do not include any that were ruled as self-defense. Only 15 of the hundreds of examples tallied in Concealed Carry Killers were eventually deemed lawful self-defense. Such cases are then removed from the site’s ongoing totals. A detailed summary of each of the 499 incidents is available at http://concealedcarrykillers.org. Clicking on each category leads to a state-by-state breakout for the incidents with current known status. To review all deaths involving concealed carry killers, click on “Total People Killed by Concealed Carry Killers.” To view a list of incidents organized by state, visit http://concealedcarrykillers.org/state-by-state-fatality-information/.